Trying to lose weight? Then, getting one of the best digital weighing machines should be your first investment. Why because, without knowing how much weight you’re losing through the diet or exercise, you might be just wasting your valuable efforts and time as well. Tracking your weight loss regularly will help you figure out whether your efforts are progressing in the right direction. So, it is highly advised to monitor your body weight week by week so that you’ll have a better understanding of what is working and what is hindering your results. When it comes to digital weight machines for body weight in India, there are several options to choose from. But, to make your job simpler, we’re listing the best bathroom weighing machine in India under Rs.1000 & Rs.1500. P.S: We prefer the digital weight machines over the conventional ones as they’re easily readable and gives accurate results, thanks to the precision sensors used in those devices. Listed below are some of the most accurate digital weighing machines available in India in the budget price segment with Smartphone app support. 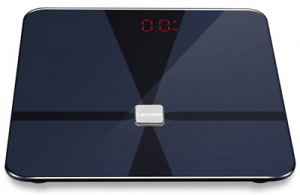 If you’re looking for some advanced weight metrics, then this Smart weighing scale from Lenovo fulfills all your requirements. Thanks to the BIA technology, the scale accurately measures your weight, body fat, BMI, body water, BMR (basal metabolic rate), muscle mass, bone mass and even visceral fat. And, you can access all these details on your mobile using the dedicated ‘Lenovo Healthy’ Smartphone app. It supports up to 30 different profiles. The scale has hidden HD LED display which activates only when you step on the machine. It comes embedded with tempered glass to ensure durability. It supports Bluetooth connectivity and is compatible with Android 5.0 & above or iOS 8.0 & above. The Smart scale weighs 1.7 Kg and can easily be carried. 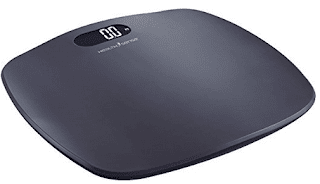 Thanks to its sleek design, durability and above all, the efficiency, the HealthSense PS 126 is currently the best bathroom weight scale in India. It comes with a special G sensor and 4 precision sensors that ensures accurate results every time you step on it. Just tap on the machine with your foot and it automatically gets calibrated. And, you can immediately step on it to check your current weight. It would automatically shut itself off after a few seconds when you step down from it. It supports weight between 5 Kgs to 180 Kgs and you can also set the weighing scale to your preferred units like Kg, Lb (pound), St (stone). You need 2 AAA pencil cell batteries (provided by default) for the machine to function. You also get 1 year warranty from the company. 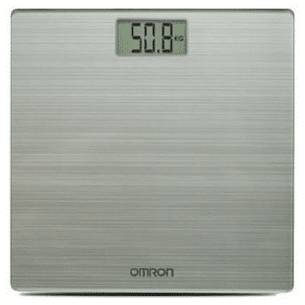 The Omron weighing machine comes with a tough body, which is further protected by a tempered glass. The body is very slim and compact and has a non-slip surface. It has auto on/off feature. That means, it automatically shuts down 16 seconds after you step away from the scale. The device supports reading of weight starting from 1 Kg to 180 Kgs. The 4 sensor accuracy technology helps in showing accurate results. You need one 3V lithium battery (comes with the packing) to operate the scale. There is also 1 year warranty on the product. 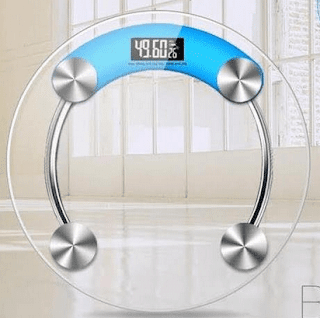 This bathroom weight scale comes with advanced step-on technology that reads your weight immediately after you step on the device, that too with high accuracy, thanks to 4 high precision sensors. The device comes with auto on/off, auto zero features and also has a tempered glass installed for exceptional sturdiness. You can change between kgs or lbs based on your preference. It supports weight starting from 5 kgs to 180 kgs. You’ll need 2 AAA batteries to operate the device. This unique looking scale comes with full transparent glass body with toughened material and would be an ideal choice for home use. The LED display shows weight, battery percentage and temperature (in room) as well. The high precision sensor ensures accurate results. There is also automatic on/off feature for better battery efficiency. It supports weight up to 180 kgs. 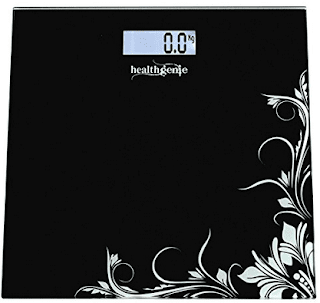 The company Healthgenie is already into making health equipment like fitness trackers, gloves, steamers, sprays etc…and they’re also good at making durable weighing machines. The body’s surface is very sturdy and resistant to slipping, thanks to the tempered glass for extra protection. The high precision strain gauge sensor system ensures that you see a accurate figure on the scale. It also comes with auto on/off feature. You can get readings starting from 5 kgs to 180 kgs. There is 1 year warranty on the product. 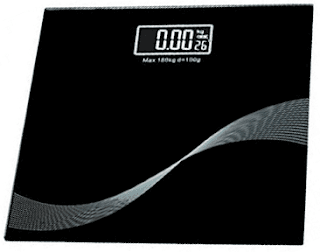 We’ve hand picked only the best digital weighing scale in India for personal use. The list will be updated if we find any new models that are worth the entry.